Join us at The Fairmont Waterfront hotel for the Symposium, where floor-to-ceiling views of Vancouver's harbour are all part of the magic. The Fairmont Waterfront luxury hotel showcases the best of Vancouver. Conveniently situated beside the Canada Place Cruise Ship Terminal and adjacent to the Vancouver Convention Centre, our luxury Vancouver hotel has a central harbour location, ideal for any stay. In order to receive the listed rates you will need to complete your Symposium registration. Welcome to the Fairmont Waterfront hotel in Vancouver, BC. Relaxed luxury on the West Coast. At the Fairmont Waterfront hotel in Vancouver, world-famous views, fabulous service, delightful accommodations, and our prime downtown business and leisure location make the perfect combination for an unbeatable experience in Vancouver, Canada. Our staff looks forward to welcoming you, and making your experience at the Fairmont Waterfront a lasting memory. Allow our experienced concierge team to help plan your trip in Vancouver. They offer exceptional advice and insider tips on what to see and do in Vancouver, including city tours, restaurants, shopping and local events. To contact our experts, emailwfc.concierge@fairmont.com. Enjoy our location connected to the Vancouver Convention Centre and Canada Place Cruise Ship Terminal, and within walking distance to the central business district, Gastown, Robson Street, Pacific Center shopping mall, and the Vancouver Art Gallery. Explore the seawall to Stanley Park, a 1,000 acre park in the center of the city and larger than New York City’s Central Park. The spacious conference rooms and business facilities make it easy to work away from the office, or plan a meeting, special event, wedding or conference. Ask about our Vancouver hotel room rates with views of the mountains and harbor. 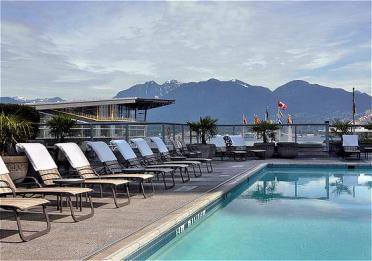 Our hotel in Vancouver, Canada offers a state-of-the-art Health Club with a wide range of fitness equipment, as well as a whirlpool, eucalyptus steam rooms, and an outdoor heated pool. Enjoy a relaxing afternoon on our pool patio overlooking the harbor and mountains! We also offer massage therapy. Forgot your runners/trainers/shoes but want to get out and enjoy the city? No problem, we will provide them for you. You can get out and enjoy the beautiful cityscape of Vancouver. Run or stroll along the seawall. Get out on a bike and tour the city on our bike-friendly roads. Vancouver, British Columbia, November 1, 2012 - Condé Nast Traveler magazine has released its annual Readers' Choice Awards survey, naming 31 Fairmont hotels and resorts across the globe as among the world's best, and recognizing all seven properties in the Pacific Northwest. In its 25th year of honoring hospitality excellence, the poll publishes the crème de la crème of travel in its November 2012 issue and this year, had a record response of 46,476 ballots. The luxury hotel brand prevailed in Canada with 14 properties recognized, and all seven properties in the Pacific Northwest region were touted as being among the best in the world. In Vancouver, Fairmont Pacific Rim took top billing as the best in the city, with recognition also going to: The Fairmont Vancouver Airport, The Fairmont Hotel Vancouver, The Fairmont Waterfront; in Whistler, The Fairmont Chateau Whistler; in Victoria, The Fairmont Empress; and in Seattle, The Fairmont Olympic Hotel. "We are delighted to have the entire region recognized on this prestigious list," said Philip M. Barnes, General Manager of Fairmont Pacific Rim and Regional Vice President of the Pacific Northwest for Fairmont Hotels. "This is an award that is shared with each and every one of our colleagues as it is through their passion and dedication our guests receive hospitality that is among the best in the world. And, residents in the Pacific Northwest only need to look in their backyard to experience a luxury stay-cation at a variety of one-of-a-kind properties." The Readers' Choice Awards rate the cities, islands, and hotels magazine readers visited in the past year, and the airlines and cruise ships they traveled with.